Well there is nothing like a cold, hard dose of reality to snap you right out of your summer haze. Last week was one piece of bad news after another. 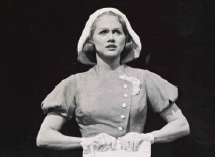 We lost not one but two bonafide theatrical legends: my old friend Barbara Cook and the great Sam Shepard. In 1975, my neighbor at the time, Wally Harper, told me I had to come sit in on a rehearsal with him and Barbara Cook. He had just started working with her, and he said her gifts hadn’t been the least bit diminished by her much-discussed excesses. I showed up, dubious but intrigued. I was so blown away by what I heard in that rehearsal room that I devoted the entirety of my next three columns to a multi-part sit-down with Barbara. She was frank and funny and naughty and gracious. We became fast friends and heavy drinking buddies. When she got sober just a couple of years later, we lost touch (if I had a nickel for the each of the people who have considered me a “trigger” I’d never have to drink swill again). It wasn’t until 1987, when she was doing A Concert for the Theatre, that we rekindled our friendship. She was comfortable enough in her sobriety to socialize with me, and I never missed another engagement of hers. She maintained her voice and her saltiness until the very end. Sam Shepard may be the only person in the history of the theater to use acting as his “day job” to support his passion for writing. A mega-talent in both departments, he made the all-but-impossible leap from the heady world of 1960’s Off-Off-Broadway to lasting mainstream fame and fortune. I never knew him (he wasn’t one to pal around with gossip columnists), but I admired him from a far. A throwback to the gritty and brooding literary lions of the early-mid 20th century, his public persona was as seductive and intriguing as his prose. Neither will soon be forgotten. And, finally, last week brought about the shocking news that Luann (née Countess) De Lesseps’s marriage to Tom D’Agostino has come to its very fast conclusion. If these two sweet and simple lovebirds can’t make it work, what chance do the rest of us neurotics have? Spotted Tony Award-winner and Texas native John Benjamin Hickey at Sagaponack’s Townline BBQ picking up dinner to go. Caught Candice Bergen ordering pasta with truffles at Lusardi’s. Overheard Jeff Bridges asking a passerby about her terrier by Riverside Park.